In the cold light of morning, the day after my collecting my somewhat rash eBay purchase, I stumble out to the garage. The E46 still looks as good as it did last night, the deep blue paintwork gleaming in the light spilling in from the roller door. But all is not well. Overnight, the car appears to have wet itself. Nervously, I crouch down to inspect the damp patch underneath the front left wing. To my relief, it smells of screen wash, rather than oil or antifreeze. It’s at that point I remember the Beamer has headlamp washers – one of which is presumably the cause of its sudden incontinence. Come to think about it, the seller had mentioned something about a fluid leak, but I’d assumed it would be up at the washer bottle, not down in the wing. Oh well, one to investigate. That aside, the car is going well. A more vigorous test run later in the day confirms that it feels pretty well sorted – as indeed you’d hope for a 60,000 mile example sold at top-dollar. 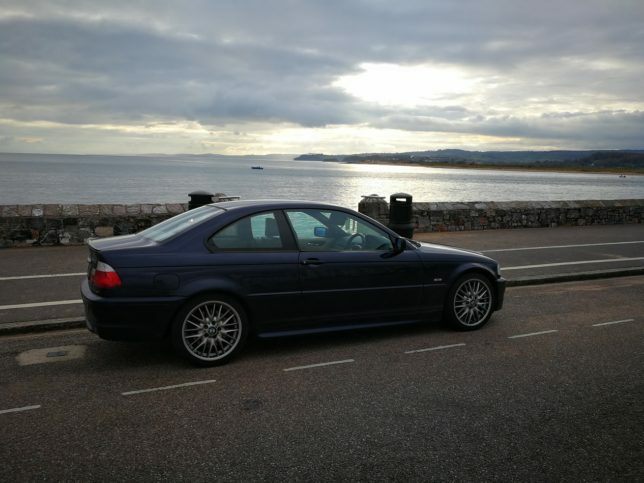 The engine is mechanically quiet, the steering feels taut and there’s a lovely sensation of rear-wheel drive balance, even though the 330Ci seems determined to resist any attempts at throttle-induced hooliganism. There are a few caveats to that, however. Firstly, the engine picks up well at low revs and seems to pull strongly over the last few thousand rpm, but it feels a little flat in the mid-range. There are no obvious flat spots, smoke or anything like that so I’m wondering if I’ve just been a bit spoilt by modern turbo engines. It’s not as strong as I’d expect a 3-litre sports saloon to feel in 2017, but maybe that’s just progress? Secondly, while the front end – polybushed by the previous owner – feels very good indeed, the back has an occasional tendency to skip over mid-corner bumps. To date, I’ve only found one corner where it does it – so again, I’m wondering if it’s just a quirk – but it doesn’t seem as well controlled as the front. Maybe a set of rear bushes need to be added to the Christmas list? Overall, though, I’m chuffed. Drop it down a cog and the E46 goes from ‘slightly naughty’ to ‘potential ban’ deceptively quickly. It’s also a nice place to sit and a nice thing to listen to (the Harman Kardon stereo is excellent, but I’ve found myself turning it off more than once to hear that creamy straight six). As for the question mark over its performance … well, I have plans to tackle that.